So many books, websites, apps, and podcasts claim they contain the secrets to finding happiness. But rarely are they backed by research or real tools - instead just anecdotal fairy tales that work for a select few. 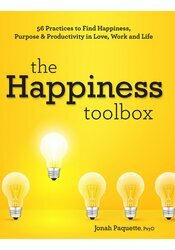 The Happiness Toolbox is here to help, by providing you with science-backed exercises to change your life. An interactive journaling format helps you learn how to choose happiness by adding simple habits into your daily life - putting you in a long-lasting and fulfilling state of mind. Jonah Paquette, PsyD, is a licensed clinical psychologist, speaker, and author. He is the Director of Clinical Training at Kaiser Permanente Vallejo in the San Francisco Bay Area, where he runs an APA-accredited postdoctoral residency program and oversees a team of over 30 mental health trainees. In addition to this role, he conducts group and individual psychotherapy, performs crisis evaluations, and teaches a weekly class on happiness for the clinic. Beyond his clinical work and writing, Dr. Paquette offers trainings and consultations to therapists and organizations on the promotion of happiness, and conducts professional workshops around the country. A frequent media contributor, he has been featured in print, online, television, and radio outlets as well. In addition to this book, Dr. Paquette is the author of Real Happiness: Proven Paths for Contentment, Peace, and Well-Being (PESI Publishing 2015), a research-based self-help book in which he distills the key findings in the field of happiness research, and offers user-friendly tools to achieve lasting well-being. — Linda Graham, MFT, author of Bouncing Back: Rewiring Your Brain for Maximum Resilience and Well-Being. "The Happiness Toolbox provides simple, easy-to-use skills grounded in scientific research to help you become happier and healthier. With practical tips and useful exercises, this book is a must-read for anyone looking to boost their well-being and life satisfaction."